Secretary of State John Kerry flies to Russia to meet President Vladimir Putin during his first visit to the country since the beginning of Ukraine in early 2014. Kremlin spokesman Dmitry Peskov called the visit a “positive step” and said the Russian president was prepared for “extensive” discussions at the meeting in Sochi. 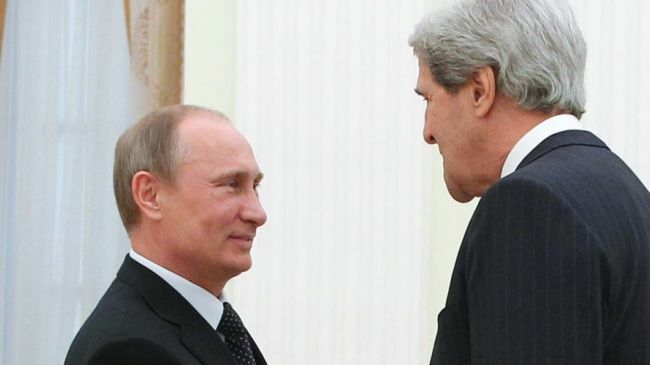 Jonh Kerry will also meet his Russian counterpart Sergei Lavrov. The West accuses Russia of arming rebels in eastern Ukraine and sending troops there – charges Moscow denies. More than 6,000 people have been killed since fighting began in April 2014 between Ukrainian government forces and Russian-backed rebels in the eastern Donetsk and Luhansk regions. The conflict followed Russia’s annexation of the Crimean peninsula in southern Ukraine. State Department spokeswoman Marie Harf said John Kerry’s trip was “part of our ongoing effort to maintain direct lines of communication with senior Russian officials and to ensure US views are clearly conveyed”. Dmitry Peskov praised John Kerry’s decision to travel to Russia, adding: “We are always open to showing a political will for a broader dialogue. Vladimir Putin’s spokesman said Russia was prepared to discuss international “hot spots” as well as bilateral relations, and that the issue of Western sanctions against Russia would not be raised by the Russian side. Earlier, Russia’s Foreign Ministry issued a statement blaming the US for provoking the Ukraine crisis and attempting to “isolate Russia” while demanding its allies follow suit. John Kerry’s visit comes two days after German Chancellor Angela Merkel attended a wreath-laying ceremony in Moscow to commemorate the Russians killed during World War Two. At a joint news conference with Vladimir Putin, Angela Merkel said the annexation of Crimea had caused “a serious setback in our relations”. Angela Merkel and other Western leaders boycotted a military parade in Red Square on May 9.